Hardgainers need not worry any longer. Part 1 of this 4 part series covers nutrition for real musclebuilding. Try it and leave your skinny past behind. There are millions of people out there that would love nothing more than to have a blueprint or a written plan on how to go from Steve Urkel to Ronnie Coleman. Skinny people out there are hoping, dreaming, and praying that someday they can be bigger, stronger, better looking, and more confident in themselves. Well, I am here to let you know that it is possible and yes, you can do it. It is not easy, but it is possible if you want it bad enough and are willing to do whatever it takes to meet your bodybuilding goals. Believe me, I know. I graduated high school at 17 years old, 5-foot-8 and 125 pounds. My upper arm measurement was 10 inches, flexed! I am going to give you the blueprint I used to develop my physique into something that I could be proud of. This four-part series is going to cover every aspect and give you all of the tips necessary to do what I did or become even greater. Part one is going to cover nutrition. Part two will be supplements, followed by training, and finally motivation. When you think of bigger guys, you develop images of them benching 500 pounds, curling dumbbells that you would use as doorstops, and leg pressing what appears to be a small house. I want you to get these images out of your head right now. Growing doesn't take place in the gym, it takes place at the table. I don't believe musclebuilding is 50 percent training and 50 percent nutrition. I want you to think that nutrition is 100 percent and training is 100 percent from now on. The smaller percentages translate to some people into that percentage of effort being needed. You must devote 100 percent to nutrition. I am not going to get into a major science lesson on nutrients. You can find all of that information all over Bodybuilding.com. I am going to give a quick definition of what they do and tell you how much you need. Protein are part of every cell, muscles, connective tissues, enzymes, etc. You need protein to build muscle. You need a lot of protein, straight and simple. You want 1.5 grams per pound of body weight. If you weigh 125 pounds (like I did) that means you want 125-188 grams of protein per day. Good sources of protein can be tuna, egg whites, steak, protein powders, skim milk, or even 90/10 ground beef. 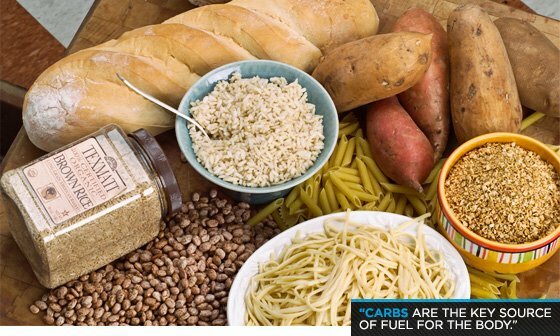 Carbs are the key source of fuel for the body. Most carbs are either simple (fruits), complex (healthy breads, potatoes), or fibrous (veggies). You want to go for about 2.5 grams of carbs per pound of body weight. For the 125 pounders out there, that is 250-315 grams of carbs per day. Eat a veggie with every meal. Go for fruit in the morning, but stay away from them in the evening. You want to gain quality mass and you want the simple carbs in the morning so the body will burn them when they need them. Eating them in the evening could leave them unused and may be stored as fat. The fats you want are called Essential Fatty Acids (EFAs). They also contribute to energy, diffusion of oxygen into the bloodstream, and they can help regulate moods. There are many more benefits, but these alone should motivate you to eat them. Get the notion out of your head that fats are bad. You need them, period. They can be found in salmon, tuna, pumpkin seeds, and walnuts. Stay away from nonessential fats. I took in a maximum of 80 grams of fat per day. Water is essential for the human body anyway. Water clears out toxins, helps metabolize fat, and reduces water retention. Your body is 70% water. As a hardgainer, you better learn to love it and not go anywhere without it. Drink one gallon a day. That is a lot, but since you are trying to literally build muscle that isn't there, you will need it. You are probably reading that and thinking, "How can I fit all of that into three meals a day?" You don't. You get all that in six to eight meals. Every 2-3 hours, you eat. You eat a serving of protein, one or two servings of carbs (always a veggie), and drink water with every meal. A meal can consist of something like this. That could make a great lunch right there. If you are on the run and need to eat something quick, go for something like this. The key is to eat as often as possible. Your body needs that nutrition constantly in order to grow. If you tried to cram all that food into three meals, your body won't use it all and store the extra as fat. That is not the mass you want. Eating more often and having smaller, balanced meals keeps the body running efficiently which goes a long way into growing. It takes some time to get used to, but in the long run, you will build muscle, have more energy, and feel healthier overall. Trying to take in so much food as often as you will need to is not easy and is hard to keep track of in your head. Are you sure you ate a couple of hours ago? Did you get enough protein today? This is where a nutrition log is handy. 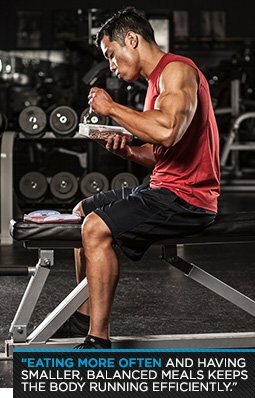 You keep track of your food just like you keep track of what weight you lift in a training log. It is not that difficult. You just write down what time you ate, what foods you ate, and if you want, keep track of the calories, protein, carbs, and fats. Let's use breakfast as an example. You had breakfast at 8:15 this morning. You ate egg whites, had a couple slices of whole grain toast, and some walnuts. You also drank water. You just post this as an entry in your log. You just do that with each meal throughout the day. If you happen to miss a meal, don't sweat it. Just post you missed it and move on. Also keep track of your weight in your log. If you notice you are having trouble gaining mass, look back at your log and you may notice something you are missing. Logs are a great tool and are valuable to your success. If you have a BodySpace account, you can use your BodyBlog. It is a great tool and others can see it so it will keep you motivated to stay on track. If you don't have a BodySpace account, signing up for one is free. Just because you don't see pizza, burgers, ice cream, or other treats listed in this diet does not mean you can't have them. This is going to take a lot of effort and a reward every now and then doesn't hurt. I would treat myself to one cheat meal every two weeks. I would buy a pizza, or eat a couple of double cheeseburgers, and then get back on track. If you start cheating more than that, your gains may not be all muscle and what is the point of gaining muscle if it is going to be covered by fat? Also, if you have to choose between eating something not on your plan or not eating at all, always eat. Skipping meals will not help you. If you have to stop at a fast food restaurant, find something relatively healthy on the menu and order it. There are healthy choices at most restaurants, so you don't have to suffer too much. Just avoid temptation and stay away from the Big Macs and Baconators. Please do not take nutrition lightly. The foods you eat and how often you eat them is a direct influence on how you get bigger and stronger in the future. You follow this plan and you will be well on your way to your ultimate fitness destiny. If I can do it, trust me, you can do it. The next part of this series is going to cover supplementation. What are the essentials to gaining mass? Which ones should you avoid? I will cover these topics and more. Just wanted to say thanks for the motivation, and game plan to finally put some size on. Quite a few years back I was a "gym rat." I spent 3-4 years there, and never seemed to be able to put any size on. Long story short I got discouraged and quit 135 pounds and disgusted with my genetics. About four years past, my metabolism slowed a bit. I was walking around a weak 135-140 natural. Earlier this year I had a bout with food poising, and lost weight. I went down to 121 to be exact. After that I couldn't seem to get back to my old weight, I just stayed at 130, it was so frustrating. Then one of my buddies started lifting, and I vowed to get back into it and get results. He later ended up flaking out but I kept lifting at home. A few weeks later I stumbled onto your hardgainer article, and was immediately drawn in. I mean here is someone that came from where I am, and put on some real size then wrote an article about how to do it. Unlike every other one I read from some "genetically inclined" guy that to be honest has no idea what its like to be a small guy. Thanks for taking your time to break it down and get me motivated. I've been following your guidelines quite closely, and I am seeing great results! I'm at 153 and going strong, I've never been so big and seeing results just motivates me more and more. Sorry for the long message, but I wanted you to get a little background as well.